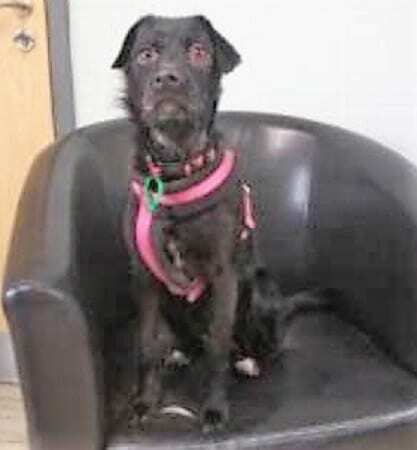 This is cute Indie, a scruffy, but very lovable Terrier crossbreed who was found as a stray. She is looking for a quiet home where she will get lots of cuddles and is currently being cared for by Jerry Green Dog Rescue in Boston, South Lincolnshire. Indie is around 7 years old and she is a sweet girl who loves everyone she meets. In fact, everyone tells her that she is such a sweetheart. She is very easy-going and very gentle. She is also happy to be left alone. Indie is very clean in the kennel, so she is possibly house-trained and she travels well too. Her favourite thing to do is to laze around all day long and also have lots of cuddles, the more the better. Indie is looking for a home without other dogs as she likes to have all the attention to herself, but she could possibly live with cats pending introductions. She could also share a home with children aged 12+. Indie has possibly got some allergies (the Rescue is currently awaiting results) and may need a special diet or medication when they flare up. She has had her ears sewn up, possibly due to a bad infection, so it does mean she has limited hearing. She has been spayed. Please mention that you saw Indie on the Oldies Club website.